A1 Group Training have a range of Civil Construction/Earth Moving Short Courses available to participants. There is no set commencement date for these types of courses as they commence at a time to suit participants’ availability. ​To enrol in any of our Short Courses you will need a Unique Student Identification number (USI). You cannot be issued with a Certificate or Statement of Attainment unless you have a USI. ​You can create your own USI by visiting www.usi.gov.au. Or authorise A1 Group Training to create one on your behalf. ​Students should be able to read and write English at the level required to perform the work in the qualification/unit of competency. A1 Group Training’s trainer will provide all participants with a Language, Literacy and Numeracy assessment on enrolment and will provide participants with the necessary referral for support if required. Participants must provide their own personal protective equipment (PPE) and A1 Group Training will provide all learning material on enrolment. Students must have access to all workplace documents such as safety and emergency plans and safe work method statements (SWMS) to successfully complete the courses offered. ​Please download and read the Student Handbook outlining all our Policies including the Refund and Cancellation Policy and Complaints and Appeals Policies. All of the single units of competency listed below are from the RII Training Package. They are suitable for candidates who are required to operate heavy plant and equipment in the Resources and Infrastructure Industries. The short courses are available by completing the full course or through Recognition of Prior Knowledge (RPL). Only experienced operators can apply for RPL. Candidates completing the full course are provided with face-to-face knowledge training as well as practical hands-on-training using the machinery and equipment in a work environment. ​​​Varies depending on participant’s prior experience. ​​​Toowoomba however training can be arranged at any location in Queensland with a particular focus on the Darling Downs, Surat Basin, Southern Queensland and up to Mackay. Training outside these areas can be considered on a case-by-case basis. ​​​​A Statement of Attainment will be issued on successful completion of the course. This unit describes a participant’s skills and knowledge required to conduct roller operations in Civil Construction. This unit is appropriate for those working in operational roles. Licensing, legislative, regulatory and certification requirements that apply to this unit can vary between states, territories, and Industry sectors. Relevant information must be sourced prior to application of the unit. Planning and preparing; conducting machine pre-operational checks; selecting, removing and fitting attachments; operating and relocating the machine; and carrying out operator maintenance and clean up. ​Varies depending on participant’s prior experience. Toowoomba however training can be arranged at any location in Queensland with a particular focus on the Darling Downs, Surat Basin, Southern Queensland and up to Mackay. Training outside these areas can be considered on a case-by-case basis. ​​A Statement of Attainment will be issued on successful completion of the course. This unit describes the skills and knowledge required to conduct civil construction skid steer loader operations in civil construction. This unit is appropriate for those working in operational roles. Licensing, legislative, regulatory and certification requirements that apply to this unit can vary between states, territories, and industry sectors. Relevant information must be sourced prior to application of the unit. 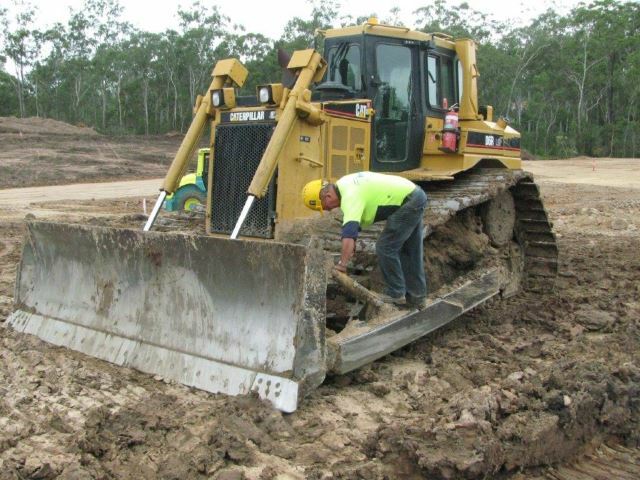 Planning and preparing; conducting machine pre-operational checks; operating skid steer loaders; stripping/spreading topsoil and materials, backfilling, lifting, loading vehicles, excavations, mixing materials, selecting, removing and fitting attachments; relocating the skid steer loaders; carrying out machine operator maintenance; and cleaning up. ​A Statement of Attainment will be issued on successful completion of the course. ​This unit describes a participant’s skills and knowledge required to conduct backhoe/loader operations in civil construction. This unit is appropriate for those working in operational roles. Licensing, legislative, regulatory and certification requirements that apply to this unit can vary between states, territories, and Industry sectors. Relevant information must be sourced prior to application of the unit. Planning and preparing; conducting machine pre-operational checks; operating backhoe/ loaders; operations to specification using a variety of material types including: mixing materials, stripping/spreading top soils and materials, trench excavation, backfilling, lifting and carrying materials, loading dump trucks, wagons, hoppers, chutes, and cutting/boxing; selecting, removing and fitting attachments; relocating the backhoe/ loaders; carrying out machine operator maintenance; and cleaning up. ​​This unit describes a participant’s skills and knowledge required to conduct civil construction excavator operations in civil construction. This unit is appropriate for those working in operational roles. Licensing, legislative, regulatory and certification requirements that apply to this unit can vary between states, territories, and industry sectors. Relevant information must be sourced prior to application of the unit. Planning and preparing; conducting machine pre operational checks; operating the machine; using a variety of material types and activities including: loading, cutting/boxing, stripping/spreading, lifting and carrying materials, bulk excavation, mixing/backfilling, trench excavation, stockpiling, battering, benching; selecting, removing and fitting attachments; relocating the machine; carrying out machine operator maintenance; and cleaning up. ​This unit describes the skills and knowledge required to conduct civil construction wheeled front end loader operations. This unit is appropriate for those working in operational roles. Where equipment being assessed requires the fitting and removal of attachments to be demonstrated an integrated tool carrier unit should be used. Licensing, legislative, regulatory and certification requirements that apply to this unit can vary between states, territories, and Industry sectors. Relevant information must be sourced prior to application of the unit. Conducting wheeled front-end loader operations in the civil construction industry. It includes: planning and preparing; conducting machine pre-operational checks; driving and operating the equipment to site conditions, applying safe work practices and identifying and reporting all potential hazards, risks and environmental issues, applying problem solving and troubleshooting techniques, applying levelling techniques, selecting and using the required tools and equipment, working safely around other machines and personnel, safely parking and securing equipment, carrying out operations to specification in different material types including: mixing materials, stripping/spreading topsoil and materials, loading, cutting/boxing, back-filling, lifting and carrying materials and site clean-up. A participant’s skills and knowledge required to conduct civil construction tracked front-end loader operations in civil construction. This unit is appropriate for those working in operational roles. Licensing, legislative, regulatory and certification requirements that apply to this unit can vary between states, territories, and Industry sectors. Relevant information must be sourced prior to application of the unit. Conducting tracked front-end loader operations in the civil construction industry. It includes: planning and preparing; conducting machine preoperational checks; operating the machine to specification using a variety of material types including: mixing materials, stripping/spreading topsoil and materials, loading, cutting/boxing, backfilling, lifting and carrying materials; relocating the machine; carrying out machine operator maintenance; and cleaning up. ​This unit describes a participant’s skills and knowledge required to conduct civil construction dozer operations in Civil construction. This unit is appropriate for those working in operational roles. Licensing, legislative, regulatory and certification requirements that apply to this unit can vary between states, territories, and Industry sectors. Relevant information must be sourced prior to application of the unit. Planning and preparing; conducting machine pre-operational checks; operating the machine to specification in different soil including: stripping/spreading topsoil and materials, cut and fill, battering, stockpiling, bulk excavation, cutting drains, benching, backfilling, removing and fitting attachments; relocating the machine; carrying out machine operator maintenance; and cleaning up. This unit describes a participant’s skills and knowledge required to conduct civil construction grader operations in civil construction. This unit is appropriate for those working in operational roles. Licensing, legislative, regulatory and certification requirements that apply to this unit can vary between states, territories, and Industry sectors. Relevant information must be sourced prior to application of the unit. Planning and preparing; conducting machine pre-operational checks; operating the machine to specification using a variety of material types including cutting and maintaining drains, forming/upgrading/maintaining roads, mixing/ spreading materials, scarifying and ripping, cutting and trimming of batters, trimming of road sub-grades and pavements, form and carry a windrow, relocating the machine; carrying out machine operator maintenance; and cleaning up. This unit describes a participant’s skills and knowledge required to conduct civil construction scraper operations in civil construction. This unit is appropriate for those working in operational roles. Licensing, legislative, regulatory and certification requirements that apply to this unit can vary between states, territories, and Industry sectors. Relevant information must be sourced prior to application of the unit. planning and preparing; conducting machine pre-operational checks; operating the machine to specification using a variety of material types including: stripping of materials to specified depth, the cutting and filling of materials to line and level, stockpiling, spreading, site clean-up, coupling, operating in tandem and disengagement of equipment in coordination with other operator, relocating the scraper and carrying out machine operator maintenance. ​This unit describes a participant’s skills and knowledge required to conduct telescopic materials handler operations in the Resources and Infrastructure Industries. This unit is appropriate for those working in operational roles. Licensing, legislative, regulatory and certification requirements that apply to this unit can vary between states, territories, and industry sectors. Relevant information must be sourced prior to application of the unit. planning and preparing; performing pre-start, start-up, park-up and shutdown procedures, checking controls, brakes and attachments for manoeuvrability and serviceability and rectifying or reporting faults, operating the telescopic materials handler, selecting, attaching and securing appropriate slings and lifting gear shifting the load, selecting, removing and fitting attachments, transporting the machine and equipment between work sites, carrying out maintenance and clean up activities. ​This unit describes a participant’s skills and knowledge required to conduct civil construction water cart operations in Civil construction. This unit is appropriate for those working in operational roles. Licensing, legislative, regulatory and certification requirements that apply to this unit can vary between states, territories, and Industry sectors. Relevant information must be sourced prior to application of the unit. Planning and preparing; conducting pre-start checks prior to commencing operations and shutdown procedures on completion of operations, carrying out vehicle refuelling requirements and procedures, driving and operating the equipment to site conditions, applying safe work practices and identifying and reporting all potential hazards, risks and environmental issues, applying problem solving and troubleshooting techniques, applying water distribution techniques, loading, transporting, discharging and distribution of water including: completion of pressure and gravity discharging of water evenly in civil construction compaction operations in a minimum of two different soil types to meet moisture content requirements, completion of pressure and gravity distribution of water into two separate water storage facilities/receptacles, completion of dust suppression operations, selecting and using the required tools and equipment, working safely around other machines and personnel, safely parking and securing of equipment, carrying out maintenance and clean up. ​This unit describes a participant’s skills and knowledge required to conduct articulated haul truck operations in civil construction, coal and metalliferous mining and extractive. This unit is appropriate for those who work in operational roles. Licensing, legislative, regulatory and certification requirements that apply to this unit can vary between states, territories, and Industry sectors. Relevant information must be sourced prior to application of the unit. ​This unit describes a participant’s skills and knowledge required to conduct rigid haul truck operations in civil construction, coal and metalliferous mining and extractive. This unit is appropriate for those who work in operational roles. Licensing, legislative, regulatory and certification requirements that apply to this unit can vary between states, territories, and Industry sectors. Relevant information must be sourced prior to application of the unit. Panning and preparing; conducting pre-start checks, start-up and shut down procedures, driving and manoeuvring rigid haul vehicle smoothly, adjusting operation techniques for the work environment and changing work conditions, operating rigid haul vehicle within limitations, correctly positioning the rigid haul vehicle for loading of materials under at least one of the following types of loading equipment: shovels, wheel loaders, excavators, bins, conveyor belts, draglines, hauling materials to designated location/s i.e. Tip Head, Crusher pocket, Waste Dump etc, correctly positioning the vehicle for dumping of materials, unloading materials from the rear of the vehicle in designated location and limiting spillage, undertaking approved vehicle shutdown and refuelling procedures identifying issues with vehicle equipment and makes minor adjustments. This unit describes a participant’s skills and knowledge required to identify, locate and protect underground services in Civil Construction. This unit is appropriate for those working in operational roles. Licensing, legislative, regulatory and certification requirements that apply to this unit can vary between states, territories, and Industry sectors. Relevant information must be sourced prior to application of the unit. Planning and preparing to identify, locate and protect underground services identifying and locating underground services employing appropriate techniques, plant and equipment to search for services and utilities, identifying services and owners of services and utilities and site clean-up. ​This unit describes a participant’s skills and knowledge required to conduct stabiliser operations in Civil Construction. This unit is appropriate for those working in operational roles. Licensing, legislative, regulatory and certification requirements that apply to this unit can vary between states, territories, and Industry sectors. Relevant information must be sourced prior to application of the unit. Planning and preparing to conduct stabilizer operations, conducting stabiliser pre-operational checks and rectifying or reporting any faults, operating stabilizer to complete stabilization including: churning up (excavating and remixing) existing fill, refilling in layers using the stabilised material, mixing materials, applying additives, achieving specified line and depth, enhancing the properties of the existing pavement, decreasing permeability, volume change correctly and safely, relocating stabiliser safely, carrying out operator maintenance and keeping records, clearing work area and disposing of, recycling or storing materials, cleaning, checking, maintaining and storing plant, tools and equipment and clean-up. ​This unit describes a participant’s skills and knowledge required to conduct tractor operations in civil construction. This unit is appropriate for those working in operational roles. Licensing, legislative, regulatory and certification requirements that apply to this unit can vary between states, territories, and Industry sectors. Relevant information must be sourced prior to application of the unit. ​This unit describes a participant’s skills and knowledge required to conduct self-propelled compactor operations in civil construction. This unit is appropriate for those working in operational roles. Licensing, legislative, regulatory and certification requirements that apply to this unit can vary between states, territories, and Industry sectors. Relevant information must be sourced prior to application of the unit. Planning and preparing for self-propelled compactor operations conducting prestart checks prior to commencing operations and shutdown procedures on completion of operations, carrying out vehicle refuelling requirements and procedures, driving and operating the equipment to site conditions, applying safe work practices and identifying and reporting all potential hazards, risks and environmental issues, applying problem solving and troubleshooting techniques, applying compactor operating techniques, selecting and using the required tools and equipment, working safely around other machines and personnel, compacting different material, completing towing, spreading, levelling and compacting to construction specification, identifying, removing or managing contaminants, carrying out machine operator maintenance safe parking and securing of equipment, site clean up and dispose of or recycle materials. This unit describes a participant’s skills and knowledge required to conduct tip truck operations in the Resources and Infrastructure Industries. This unit is appropriate for those working in supervisory and technical specialist roles. No licensing, legislative or certification requirements apply to this unit at the time of publication. This unit describes a participant’s skills and knowledge required to conduct local risk control in the Resources and Infrastructure Industries. This unit is appropriate for those working in operational roles. No licensing, legislative or certification requirements apply to this unit at the time of publication.